I'm a big lover of crafts. On the whole I'm a bit of an all-rounder; I love to turn my hand to all sorts of things from crochet and knitting, to sewing and paper cutting. 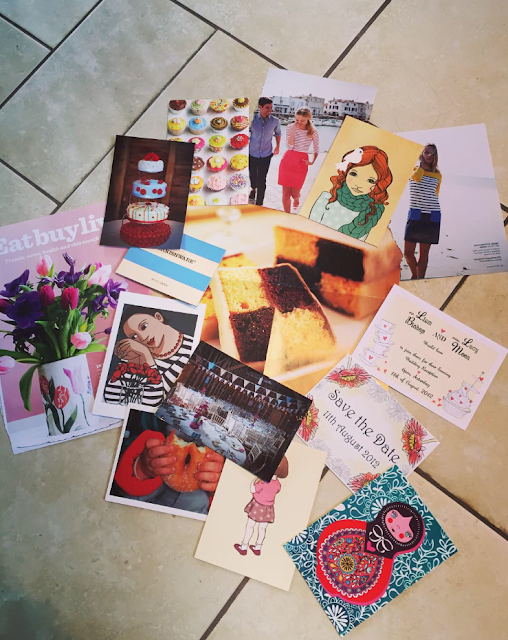 Over the years I've tried a bit of everything - painting, needle felting, card making...even my baking spills over into the artistic and creative realms. 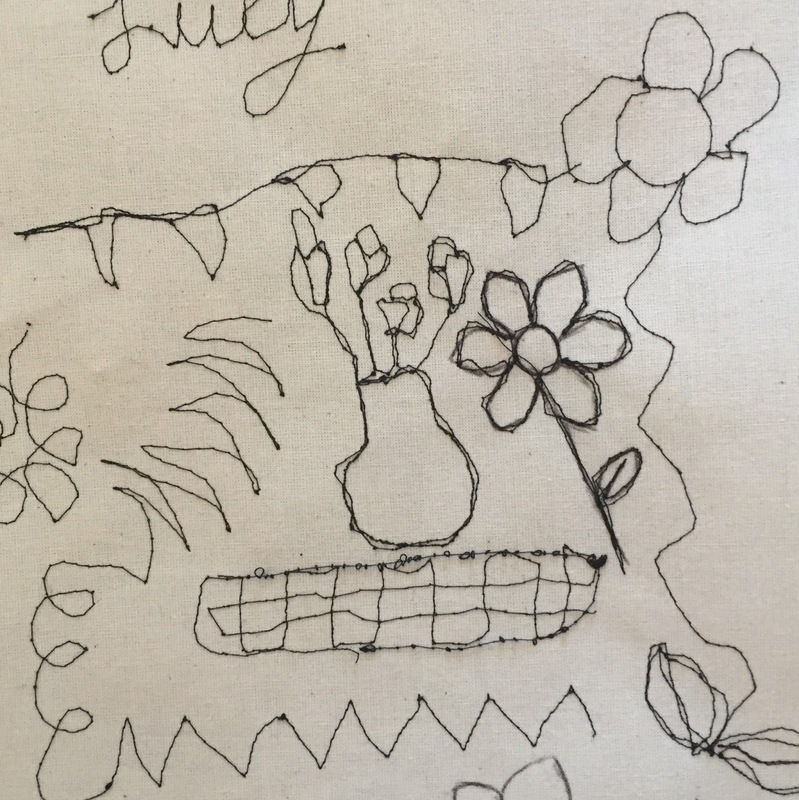 My favourite craft by far though is using my sewing machine and one of the skills I've been dying to learn for ages is free motion embroidery: the art of using your sewing machine needle as a 'pen' to create free art work - basically sketching with your machine. This skill creates the most beautiful artwork which I've admired from afar for quite a few years now, always wishing I knew how to do it too. Then, back in the summer, my friend Sarah and I headed to The Handmade Fair at Hampton Court Palace, and we stumbled upon Katie Essam's stand - she is a contemporary textile artist who uses a combination of free motion embroidery, needle felting, painting and even crochet to create the most incredible pieces of artwork. 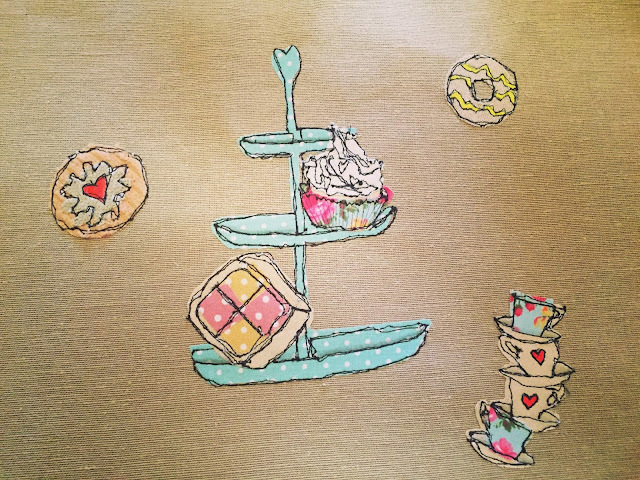 We got chatting to Katie as we admired her work, and we found out that she runs bespoke free motion embroidery courses, and that she's based not too far from us in Watford! What a result! Sarah and I didn't delay in booking up a full day's course with her, and on Friday we headed to Watford together to spend a whole day with Katie in her home studio learning how to create these beautiful bespoke pieces. Follow Lucy Bishop's board Free Motion Embroidery Ideas on Pinterest. A collection of inspiration for my first piece of free motion embroidery artwork. It was fun to get out my sketchbook and put pen to paper after so long, it got me thinking that as an adult I don't often indulge in my love of sketching...it was something I did a lot of at school/college, but as I've aged it's fallen further down my priorities list. It was wonderful to let my creative juices flow, and to challenge myself to sketch once again. On arrival at Katie's I firstly got to grips with her sewing machine, and the feeling of using a free motion foot instead of a standard sewing foot. The free motion foot allows you to move in all directions so you can use the thread as if it were a pen in your hand...it takes a little getting used to after only ever being able to move the fabric in a straight line. Messing around on my practice calico...a wobbly start! 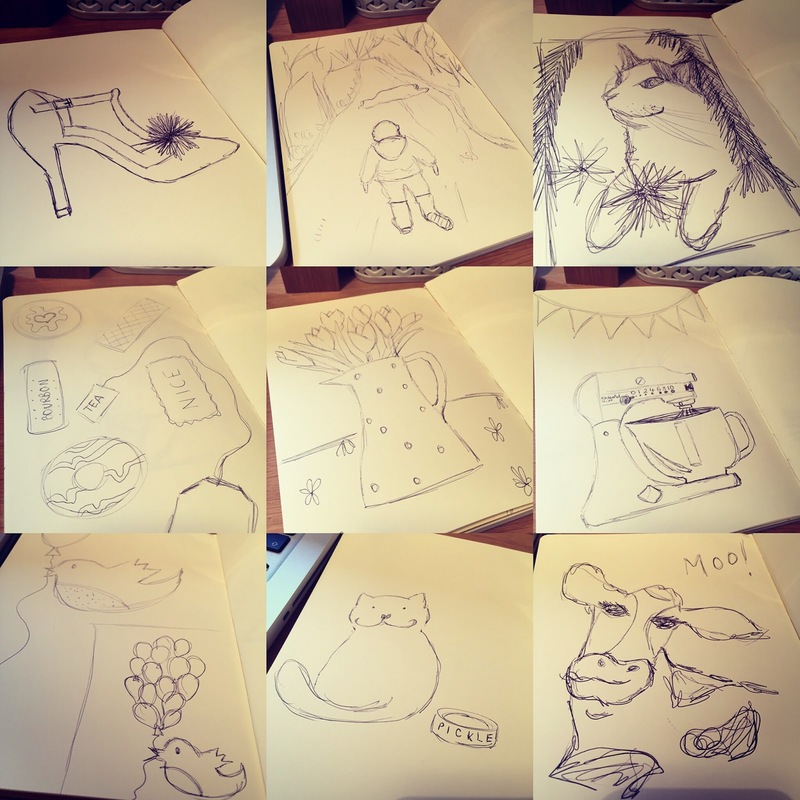 The next step involved collating all my sketches, ideas and designs to create a template for my final design. It was so hard to make a decision on what exactly I wanted to create. I had so many ideas buzzing around my head (hopefully some of which will become the inspiration for lots of future makes) but in the end I decided to use my wedding invites as my starting point, and combine images from the invite (cupcake, teacups, cake stand) with my love of biscuits, cakes, pastel colours and vintage floral fabrics to create my piece. 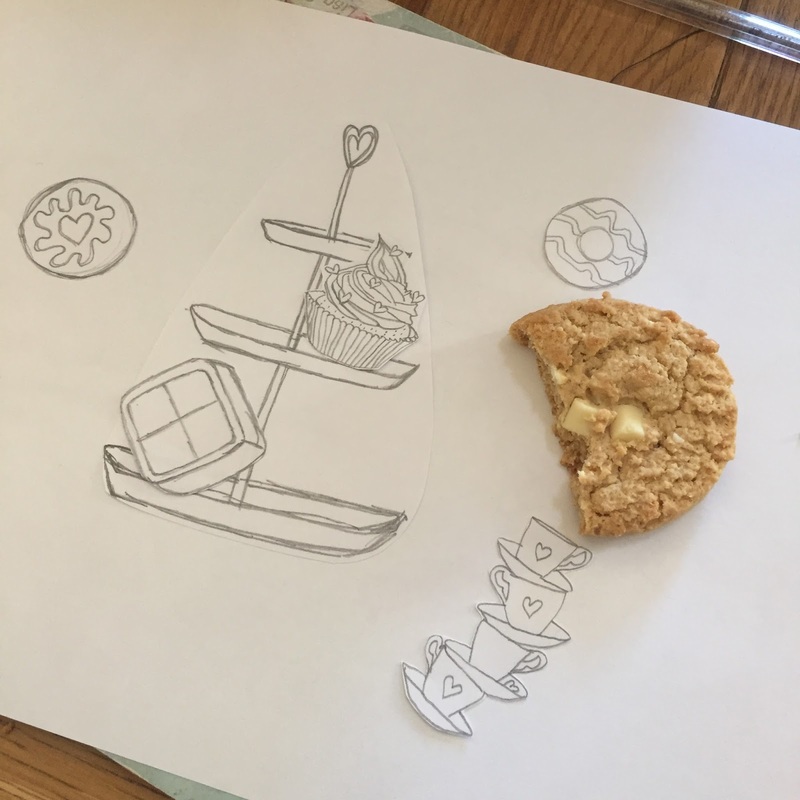 Finalising my design while munching on biscuits...naturally! It was only once my design was finalised that the proper fun began - selecting fabrics, cutting pieces and getting to work with an iron, bondaweb and then my sewing machine. Learning a new skill...free motion embroidery. Katie was so patient with me and explained everything so well - she'd prepared examples and hand outs for us to take home with us, as well as a little kit with all the bits and bobs we might need to make further free motion pieces at home. We chatted non-stop throughout the full day's course, and got to know each other as we sewed: we even got a yummy lunch to fuel our crafting! My friend Sarah who attended the course with me had done a fair amount of free motion work before, but she was excited to extend her skills/knowledge and learn some new techniques to add to her repertoire. 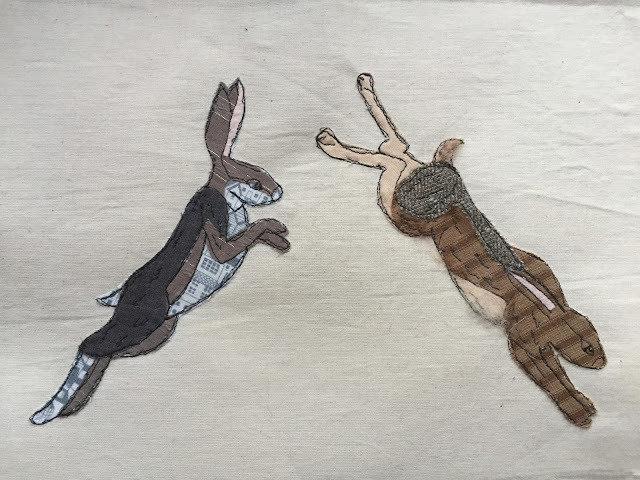 She worked on a gorgeous leaping hare design using neutral tones and tweeds, and even added a little needle felting into her final piece - I'll add a picture at the end so you can see the variety and contrast you can achieve with free motion. Sewing my final design with the free motion foot was by far the best and most rewarding part of the day - it was incredible to watch my ideas finally come together to create something I was truly proud of. My final piece: Time for Tea - now I just need to frame it! I can't thank Katie enough for all her help, encouragement, advice and inspiration on Friday. If you're local and looking to expand your skills when it comes to your sewing machine then I couldn't recommend her enough. A relaxed and friendly environment with a course bespoke for your every free motion need - Katie really lets you lead in terms of what you want to create and learn, and you'll come away armed with loads of new skills and a beaiutful piece of artwork ready to be framed. For more information on Katie's courses head to her website here. 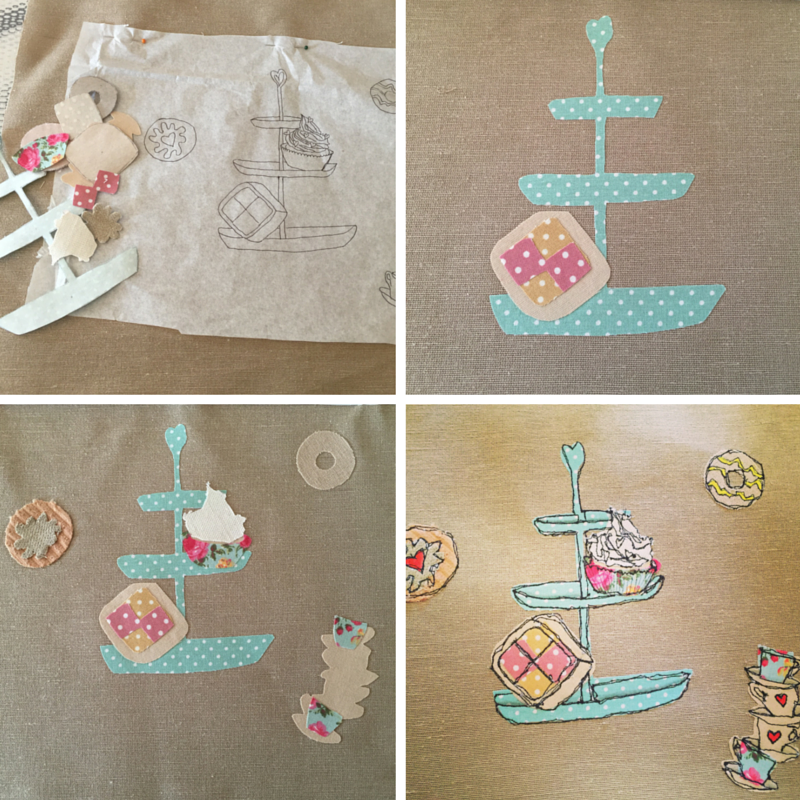 Have you ever had a go at free motion embroidery? Or would you like to learn? I ‘d mention that most of us visitors are endowed to exist in a fabulous place with kidzee play school fee structurevery many wonderful individuals with very helpful things. 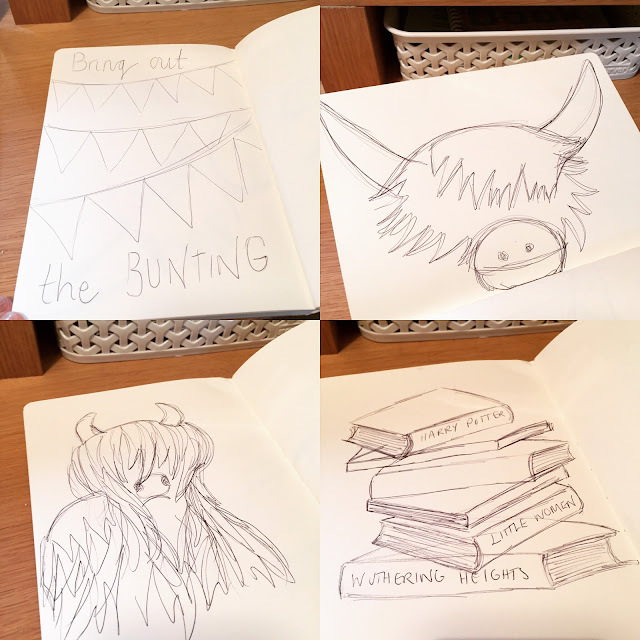 Looking back on my 'Reading Challenge' for 2015.